Turbo Twist, LifeGuard UV Sterilizer Review . The Coralife TurboTwist 3x, 6x, & 12x are very popular compact UV Sterilizer for aquarium or pond use. 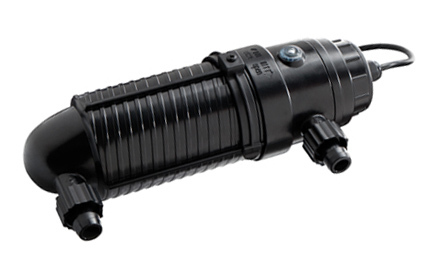 Initial results using the Turbo Twist are comparable to other compact UVs that utilize HO UVC lamps (which most no longer utilizer HO lamps), and are usually good from my experience as well as other aquarium maintenance professionals I know. However is is important to note that NO compact UV whether the 'Category B' TurboTwist, the slightly better AAP/SunSun Terminator or Tetra, or the lessor 'Category C' Jebo can compare to a high dwell time straight tube UV such as the AAP/TMC Vecton UV (as well as the 'Category A' Aqua Ultraviolet or Emperor). The Turbo Twist is simply not even in the same league!! The Turbo Twist does employ HO UVC lamps as does the AAP Terminator, unlike the Jebo and other even lower quality Compact UV Sterilizers, but this is still not enough to make up for the poor dwell time compared to better level 1 & 2 capable 'Category A' UVs such as the Vecton (which also employ HO UVC lamps). While often promoted and given reasonably good marks in websites such as Amazon, long term and actual results are not as good as often inaccurately stated in these NON professional reviews displayed on Amazon which are generally based on initial use and clarification only (which is all a 'Category C' UV which have now flooded the market are), NOT level one sterilization or higher!! One problem that is rarely noted in these Amazon reviews is the fact one of the selling points is also more of a gimmick and that is the baffles. These Baffles do NOT maintain a consistent/effective distance from the UV lamp/Quartz Sleeve at all times. As well these baffles can trap air which then impedes the optimum flow and sterilization time of these UV Sterilizers. Sometimes repositioning the Turbo Twist can help with air trapped, but often you simply need to accept this trapped air and lower your flow rate to 20 gph per watt or less just to maintain level 1 sterilization. Unfortunately many unprofessional YouTube videos further the urban myth of the effectiveness of these baffles. The other unfortunate problem of the myth of the Turbo Twist being anything other than a most basic UV Clarifier, is that while many will rave about how the Turbo Twist UV initially cleared their cloudy or green aquarium, many persons will also state after using these particular UVs that this is all any UV is good for. This UV is one that has influenced many a comment by persons I have read or dealt with in emails, etc. with little understanding of aquarium or pond UV Sterilization that all a UV is good for is clarification, but not disease control or improved Redox. The facts are, one cannot purchase this UV and then use it as a model of what a true high dwell time UV can accomplish!!! A couple of problems that often show themselves after 6-12 months are leakage due to poor build and worse a VERY high electronic ballast failure. Another issue no Compact UV can compare on is dwell time. Using a Rio 600 (200 gph), with 2 feet of 5/8" ID tubing; the dwell time inside the Vecton was 2.6 seconds, while the Terminator was 3 seconds. It is important to note that the Terminator holds DOUBLE the water volume at 20 oz. water (meaning a less efficient design with more water not within the optimal .3 cm exposure zone) versus 10 oz. of water for the 8 Watt Vecton. Keep in mind that the Terminator is one of the best designed Compact UVs, as it is noteworthy that the Turbo Twist has an even higher water volume due to even less efficient water contact design. Now consider that the TurboTwist 3x actually has a flow pattern that has less water within the correct distance of UV Lamp from UV Sterilizer containment 'wall' when compared to the Terminator used in this test. So my question is; WHY spend often as much money for the vastly over-priced TurboTwist with a lower quality Chinese build versus the European designed High Dwell Time TMC Vecton 8 Watt?? Or simply if you are looking for a good compact UV Sterilizer, consider the AAP Terminator UV Sterilizer. Either way, the Turbo Twist in my experience is the most over priced UV Sterilizer on the market for what it can do and its longevity of build (a lifespan of about 1/5 that of a Vecton or Aqua Ultraviolet), so please do not fall for the hype or misguided forum or Amazon reviews for what basically should be a $50 or less UV Clarifier. The 'Category B' LifeGuard 15 Watt is an example of another somewhat lessor known UV Sterilizer. I have used these UV Sterilizers going back to 1978. The build quality is good (comparable to the TMC UV Sterilizer), as well the dwell time is very good, however the flow pattern is not as good as the TMC Vecton & Advantage, or the Emperor and Aqua UV. I also have found these UVs somewhat over priced for what you get, although the price has come down to be more comparable to the slightly more superior TMC Vecton 15 Watt. My summary of the Lifeguard is while it is still inferior to the TMC, Aqua, Emperor; it is still an excellent UV Sterilizer and far superior to the Turbo Twist and other Compact UVs. Thanks as always for the great information you always share. I've sent this page to my cousin who has to buy his new toy. Really enjoyed your effort.Thank you very much.